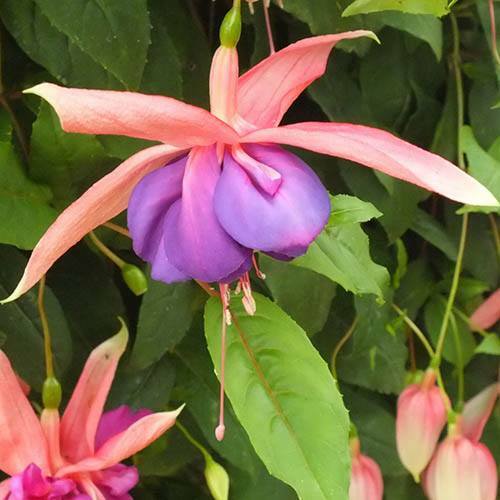 Everyone loves a fuchsia, and what’s not to love with this amazing collection of two varieties of GIANT flowered fuchsias that will WOW in your garden this summer with their abundance of show stopping flowers?! 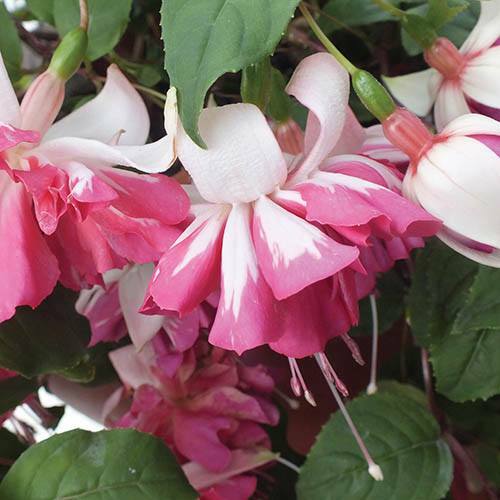 These giant novelty fuchsia will smother pots, baskets and other patio containers with huge, beautiful, delicate, yet strong and vigorous flowers and a carpet of fresh green foliage. And don’t worry, the novelty won’t wear off as these beauties will flower all summer long, well up until the first frosts in the autumn! In shades of pink, white and puple, this mixture of two varieties will complement each other beautifully – why not plant a mix in baskets and pots to create a colourful display of mix and match flowers, or plant separately in containers either side of pathways and patios to create a more formal look. Supplied as 12 Jumbo Plug Plants (approx. 2.5-3.5cm diameter rootballs). 6 of each variety; ‘Flying Scotsman’ and ‘Purple Twist’.